University of Pennsylvania Press, 9780812249880, 264pp. 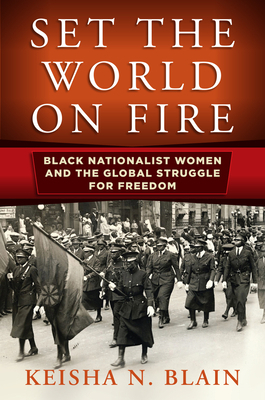 Gordon, Allen, and Jacques Garvey--as well as Maymie De Mena, Ethel Collins, Amy Ashwood, and Ethel Waddell--are part of an overlooked and understudied group of black women who take center stage in Set the World on Fire, the first book to examine how black nationalist women engaged in national and global politics from the early twentieth century to the 1960s. Historians of the era generally portray the period between the Garvey movement of the 1920s and the Black Power movement of the 1960s as one of declining black nationalist activism, but Keisha N. Blain reframes the Great Depression, World War II, and the early Cold War as significant eras of black nationalist--and particularly, black nationalist women's--ferment. Keisha N. Blain teaches history at the University of Pittsburgh.